We looked at a number of cheap saunas to see what kind of value was out there in home infrared units for consumers on a budget. We found several models that came in just under our $2000 limit with some very appealing features. 1. The JNH Lifestyles 2-person Sauna, which you can sometimes find on sale at about $1,100, is one of the most popular home saunas on the market today. It has many great features for a cheap sauna, with interior LED lights, premium sound system, and 7 carbon-fiber heater elements. It also comes with a full safety glass door, portable music player plug in and premium speakers. Assembled Dimensions /Weight: 47"L x 39.5"W x 75"H; 250 lbs. 2. The Dynamic Sauna Barcelona is another popular choice when it comes to cheap saunas. It's a 1-2 person far infrared sauna which is listed at under $1000. The unit features include Hemlock wood, low EMF, tempered glass door and window, digital inside controls, and mp3 hookup capability. Assembled Dimensions /Weight: 39.2"L x 35.3"W x 72.5"H; 250 lbs. 3. The Hemlock Deluxe from Radiant Saunas is another great inexpensive infrared unit for the home. At around $1000 like the Barcelona, this one has 6 carbon heaters, interior and exterior LED control panels, built in speakers with AM/FM, CD and mp3 hookup plus towel and magazine racks. 4. 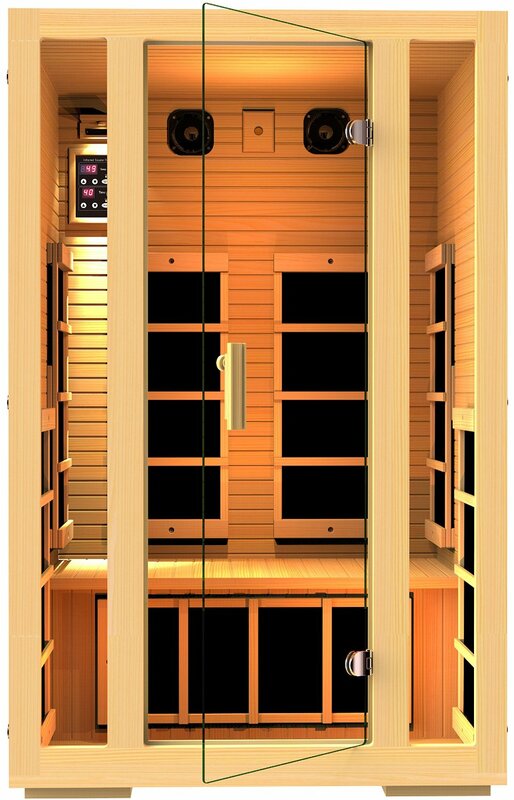 HeatWave 3-person Infrared Sauna is a very attractive model among cheap saunas at around $1500 or so on sale. The features include Hemlock wood, tempered glass door and window, digital inside controls, a convenient vent within reach (it’s not on the ceiling), AM/FM/MP3/CD player, and Color Therapy Interior Lights (Red/Yellow/Blue/Green). Want more? It includes an oxygen ionizer, cup and towel holders, and you can opt for cedar wood over hemlock. Assembled Dimensions /Weight: 53"L x 53"W x 76"H; 400 lbs. 5. The Betterlife 1-2 Person Infrared Sauna is another not option which sells for just under $2000. It’s a nice looking unit with color therapy lighting. The unit has 8 high quality ceramic heating elements that are superior to carbon emitters as far as delivering effective infrared rays to your body. Assembled Dimensions/Weight: 40"L x 36"W x 77"H; 280 lbs. As you can see, these budget priced home infrared saunas are surprisingly affordable and work well as infrared units because the small cabinet size puts the emitters closer to your body. In addition, all of these relatively cheap saunas are completely portable, and can be assembled or disassembled by two people in under an hour. Where do you find these saunas? You can find these cheap saunas online at company sites as well as various pool and spa entities. But the best deals can be found at Amazon, where they offer all of the above models at discount prices plus free shipping in many cases. Take a look there first to see if they have the model that suits your need the best, and read the reviews to see what other customers have to say about the units.